One of the recent themes of commentary around Euro 2016 has been migration. It may be because of the resonance of a major tournament returning to France, where 18 years ago a multiracial team defied the far right to unite the nation. It may be because of the emotional match between Switzerland and Albania early in the tournament, where many of the players were eligible to play for the opposing team, and two brothers lined up against one another. Or perhaps it is the continuing controversies around the far right, refugees and multiculturalism in the continent. I was curious to look at the numbers behind these trends, and to see how representative the national football teams playing at Euro 2016 are of their societies. Certain teams, such as Belgium and Switzerland have attracted a lot of attention for the number of players they include with foreign backgrounds. By contrast, it occurred to me that there are few genuine immigrants in the England team – when I looked it up, only Raheem Sterling was born abroad, and I think Dele Alli is the only other member of the squad to have a foreign parent. What could explain this discrepancy? Is it the number of migrants, or the countries they are drawn from, or their integration into society? I went through the teams of ten large Western European countries at Euro 2016 and coded the birthplace and parentage of each player. * As expected, Switzerland is the most diverse team, with 61% of players in the squad having foreign parents, and 35% born abroad. Many of these (such as Xherdan Shaqiri and Granit Xhaka) are refugees from the Balkan conflicts of the 1990s, but there are also a number of Africans, a Turk and a Chilean. More surprising (to me, at least) is Portugal’s position – it has the highest proportion of foreign born players, at 39%, and 43% of its players have foreign parentage. For the most part, this is a function of colonial ties, with players like Nani born in Cape Verde and Eder from Guinea-Bissau. However, Portugal’s position is bolstered by the fact that it not only receives large numbers of immigrants, but also sends large numbers of emigrants – Portugal and Spain are the only two nations studied which have more emigrants than immigrants. In particular, there is a large Portuguese ex-pat community in France, which supplies three members of the squad. France and Belgium are the other two teams with high numbers of immigrant players, like Portugal largely drawing on players with origins in former colonies. 11 of France’s 23 players have a foreign parent – all but one (Laurent Koscielny, whose family is Polish) from Francophone Africa. It is a similar story with Belgium, who have six players with links to DR Congo. Interestingly, most of these are second generation immigrants – only Christian Benteke and Christian Kabasele were not born in Belgium. Indeed, in general it is striking how few players were not born in the country they represent – perhaps because most migrants are too old by the time they arrive in Europe to embark on a football career. 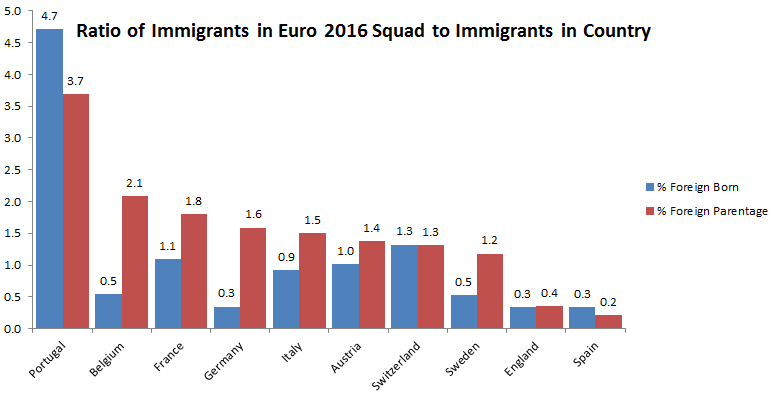 Using Eurostat data, I compared the composition of these teams to the demographics of their country – looking at the ratio of the proportion of immigrant footballers to their proportion of immigrants in the general population. This analysis confirms that Portugal is a real outlier, with many more minorities in their football than we would expect – 4 to 5 times more. By contrast, Spain and England have about as third as many as would be expected. Spain is particularly peculiar, given that it has high levels of emigrants, and so a potentially larger foreign-born pool to draw from. (These Spanish emigrants are producing footballers – Hugo Lloris, Mario Gomez, Yannick Carrasco and Ricardo Rodriguez all have Spanish parents. They just don’t play for Spain). Spain is a genuine puzzle, but in England’s case an explanation presents itself. It could be that the immigrant groups in the UK are less likely to be successful footballers. In particular, South Asians (Indians, Pakistanis, Bangladeshis) account for a particularly large share of foreign-born residents in the UK compared to other countries, and these communities do not have any track record for producing top quality footballers (Dutch international Luciano Narsingh, who is third-generation Indian via Surinam is the only South Asian to have played for a major nation by my reckoning). [EDIT: A few people have mentioned Vikash Dhorasoo and Neil Taylor as additions to this list] However, this cannot be the full story. In absolute terms, the UK has over twice as many Nigerians as there are Congolese in Belgium (and note that Nigeria has a better record of producing footballers than DR Congo), but few of these have come near the national team. One final thing of note that struck me in compiling this data: around a third of players with foreign parents were of mixed parentage. Indeed, many were eligible to play for three nations: one through birth, and one through each of their parents. My vote for most cosmopolitan backstory? David Alaba: born in Vienna to a Nigerian rapper father and a Filipino nurse mother. That this is considered so unremarkable that I wouldn’t have known it if I hadn’t looked it up says a lot about our times. Professional football increasingly reflects the ethnic diversity of modern Europe. * Data comes from Wikipedia, so may not be fully reliable. In particular, there are a number of players whose parentage is not explicitly stated on Wikipedia. I assumed their parentage matches their place of birth. I only coded second generation immigrants as immigrants – so, for example, since Mesut Ozil’s parents grew up in Germany, he was not coded as an immigrant, even though his grandparents are Turkish. Can you do this for 2018 World Cup squads? I could do, and intended to, but just never found the time unfortunately.